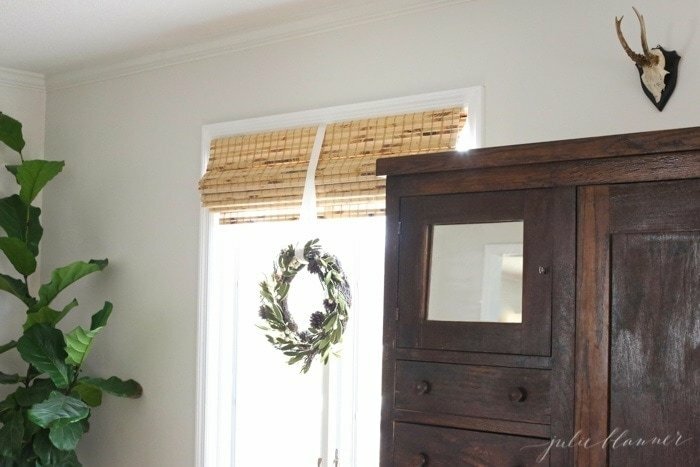 I’m excited to participate in the White Buffalo Styling Co Blogger Stylin Home Tours! If you’re coming from DIY Playbook, welcome, I’m excited to “meet” you! 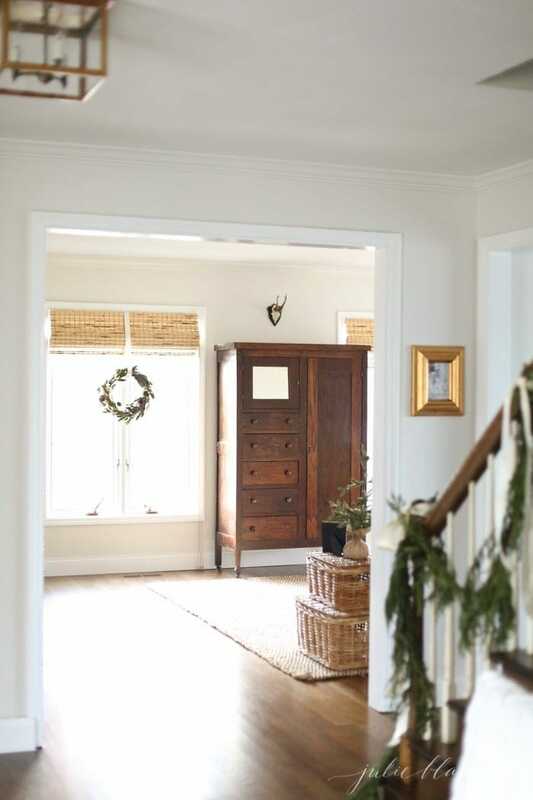 Since last year’s Christmas home tour, a lot has changed. We’ve removed a few walls and closets, a wet bar and a lot of carpet, linoleum and green tile. We’ve gutted two bathrooms, added wood floors, a lot of paint and several light fixtures. It’s been fun watching our home transition, even as we speak. Our new doors arrived last week and are being installed as I write. I had hoped that construction would be complete before the holidays so that we could enjoy a little peace, but it’s part of the process and I’m so thankful we have the opportunity to personalize our home. It’s exciting to see your vision come to life, even if it alters along the way. 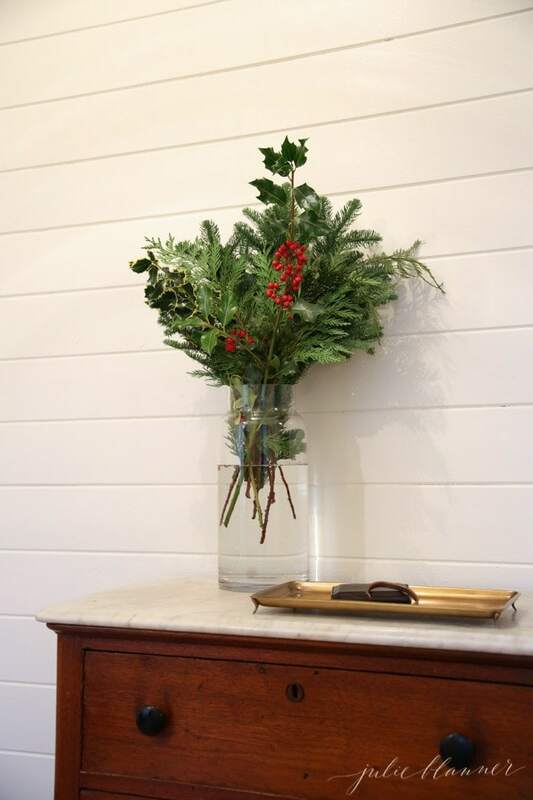 I had a lot of fun decorating our home for the holidays this year, or should I say decking the halls! 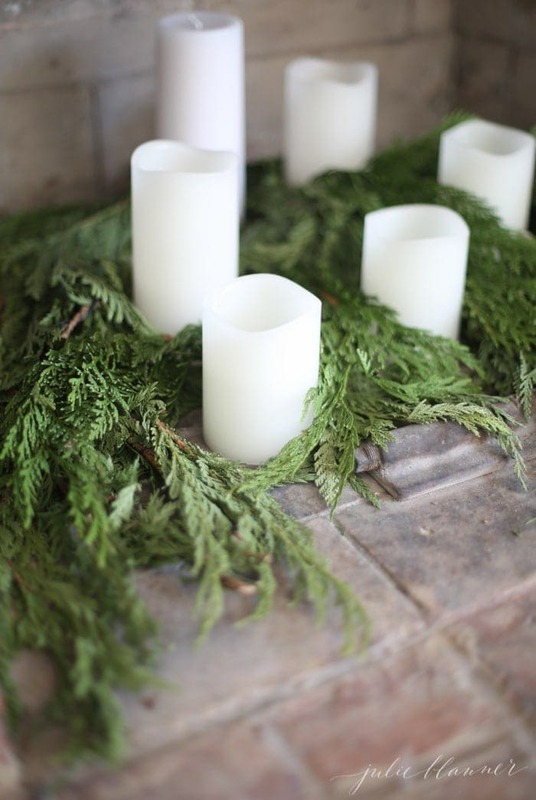 While unintended, it seems the underlying theme is hanging of the greens and candlelight. I rarely start decorating with a plan, just my heart. 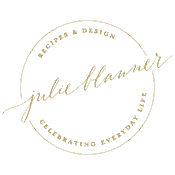 When I do attempt do decorate with a plan, I find myself frustrated that I can’t find something that fits my vision. I have to say, decorating this year was more rewarding than ever as I was able to enjoy it with the girls. The other challenge I had this year was sunlight. It’s been raining for days and the if it wasn’t raining, it was so cloudy that it may as well be. I look forward to adding a few more photos when the sun makes an appearance. 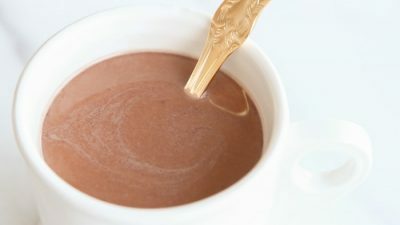 Until then, grab a cup of cocoa and come in, I’m so honored to have you! Our hung a fresh cedar garland on the stairwell this year. I ran out of my favorite ribbon, but didn’t fret. I love a loose knot almost as much as a bow. Consider it my casual approach to Christmas decorating. 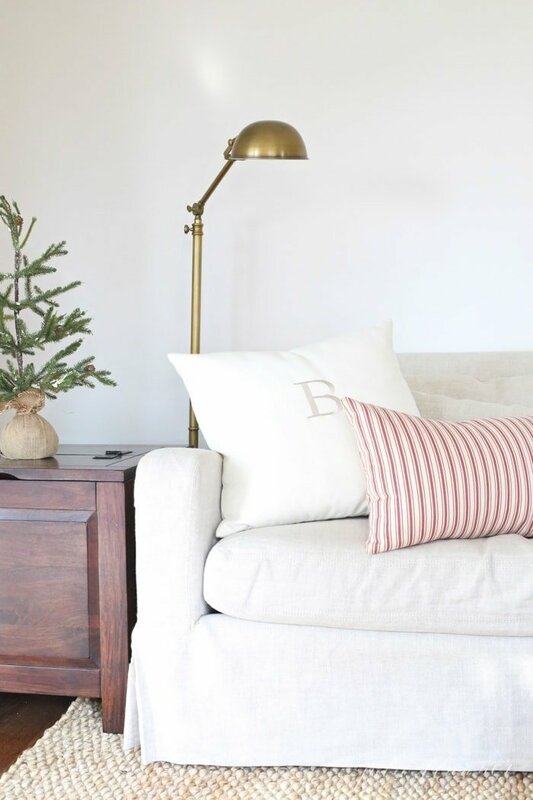 The family room has subtle nods to the holidays with bits of traditional red and green. I framed last year’s Christmas card, added felt mistletoe wreaths to the windows, updated two of our pillow covers and a couple of miniature trees. I keep our Christmas decorations child friendly for those curious little hands. Ani and Adalyn both celebrate their birthdays in January, so I integrate a lot of winter decorations that I don’t have to rush to take down, plus, I feel like a month is just too short to enjoy Christmas decor. 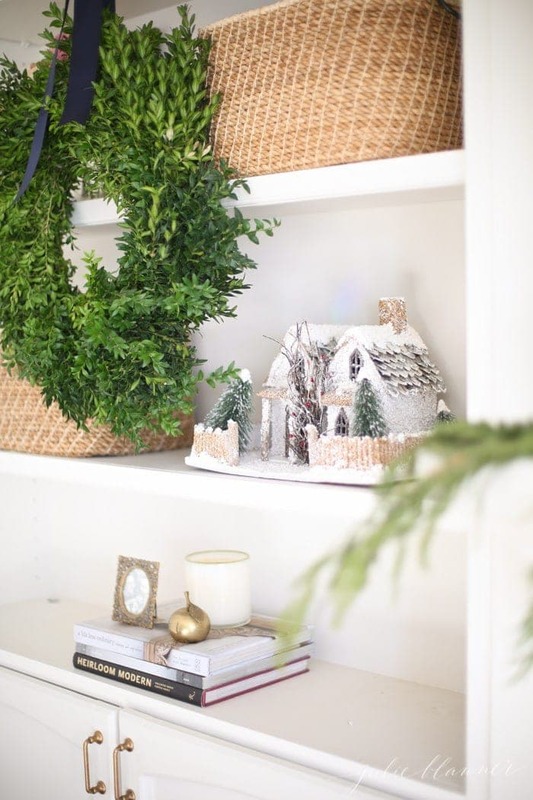 This year we added a few wintery homes to our bookcases that are adorned with boxwood wreaths. I covered the mantel in a fresh cedar swag and added bits of red cedar in the fireplace filled with candles. 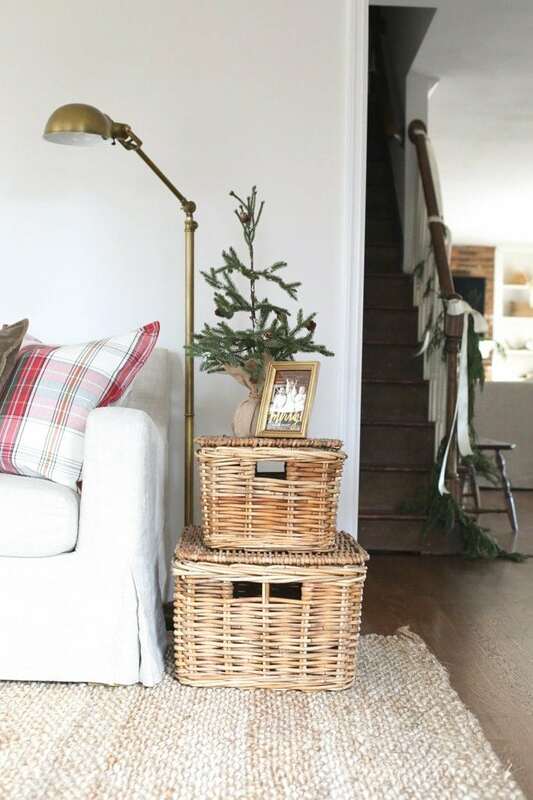 As a child, I loved decorating for Christmas, but always dreaded unpacking and packing bins. I take a slightly more utilitarian approach to Christmas, updating our everyday decor rather than decorating with specialty items stored throughout the year. 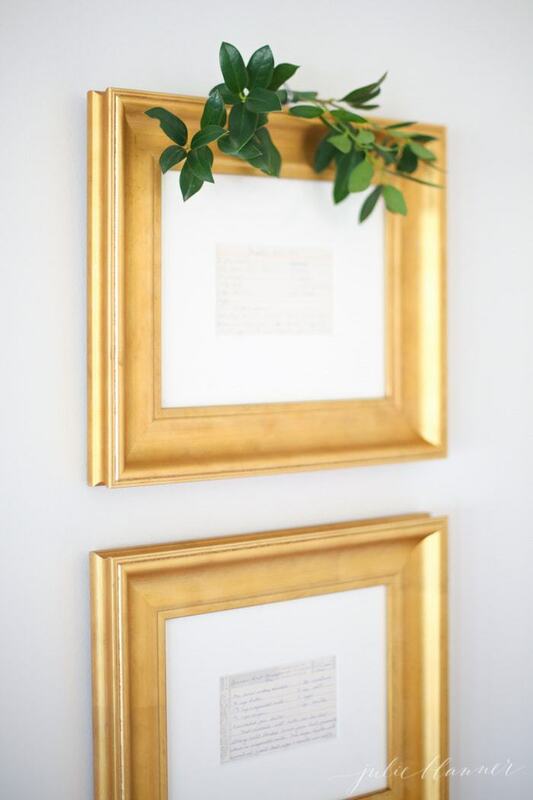 Adding snips of holly in a vase and on my framed recipes is just one way I update existing decor. 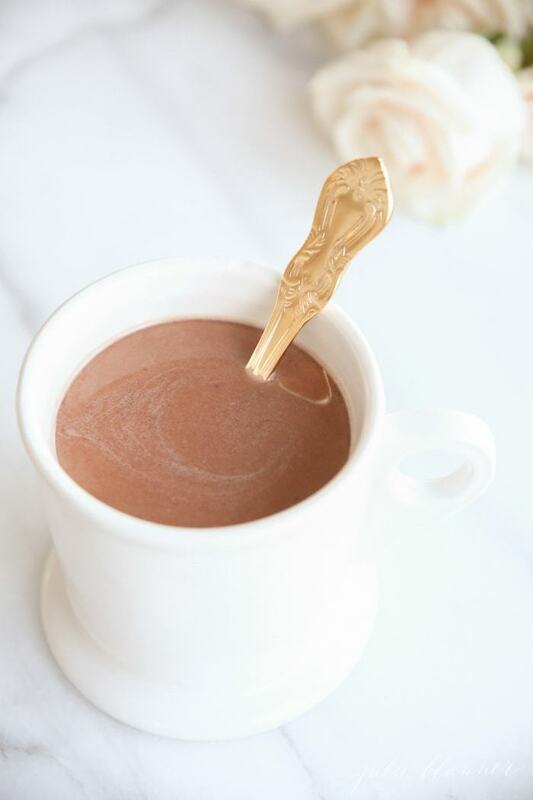 It’s so easy and feels festive without a lot of effort. 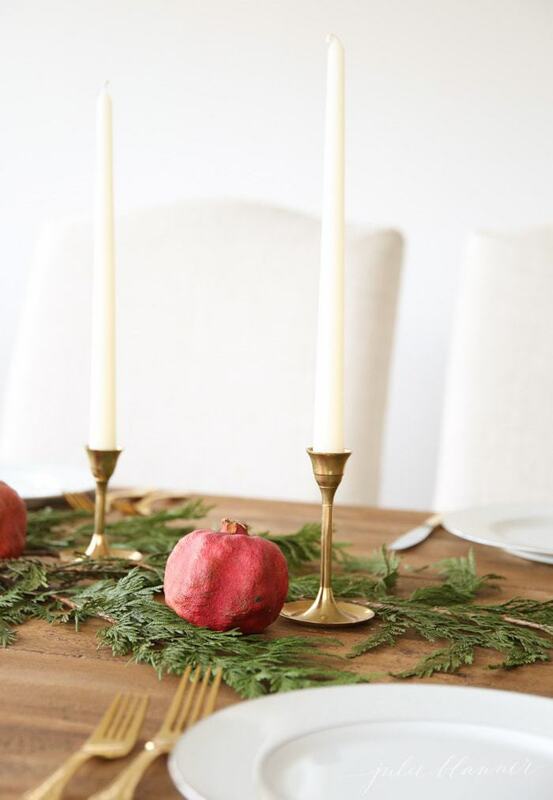 I created a quick centerpiece with cedar and pomegranates that still graces our table a month later! You can learn how to recreate it here. 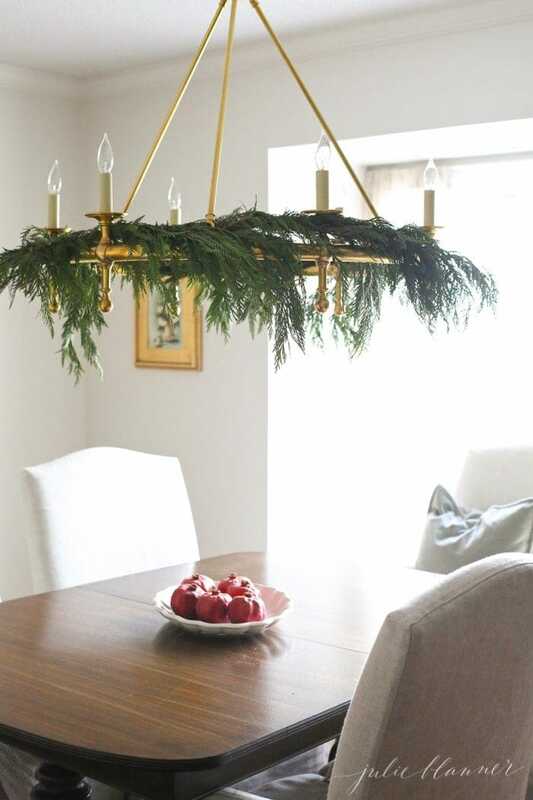 A little red cedar goes a long way on my new brass light fixture in the dining room. This year, the girls each got their own Christmas tree. We made colorful salt dough ornaments the day after Thanksgiving to decorate their trees so that we didn’t have to worry about breaking them. 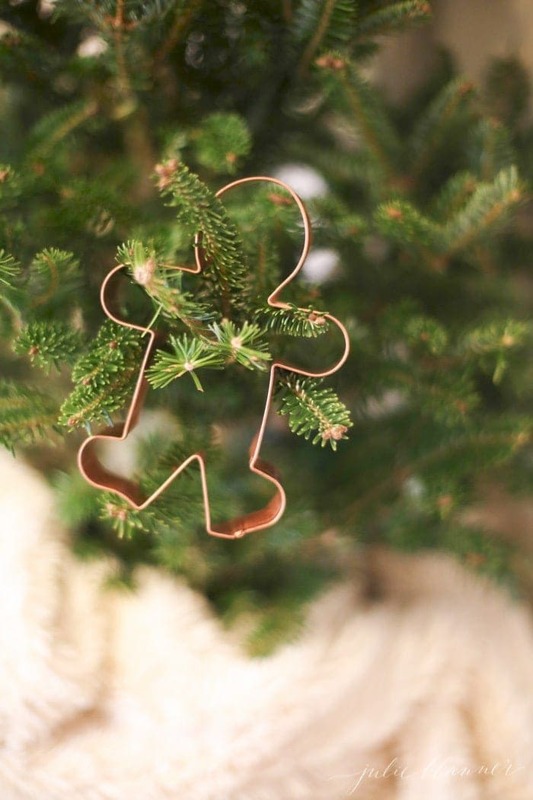 We decorated Isla’s tree with copper cookie cutters as well. 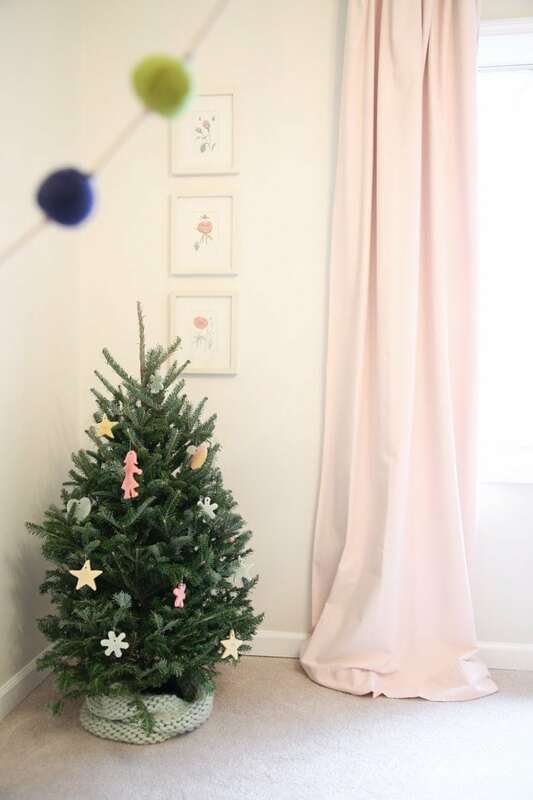 In lieu of tree skirts, we used blankets and infinity scarves. 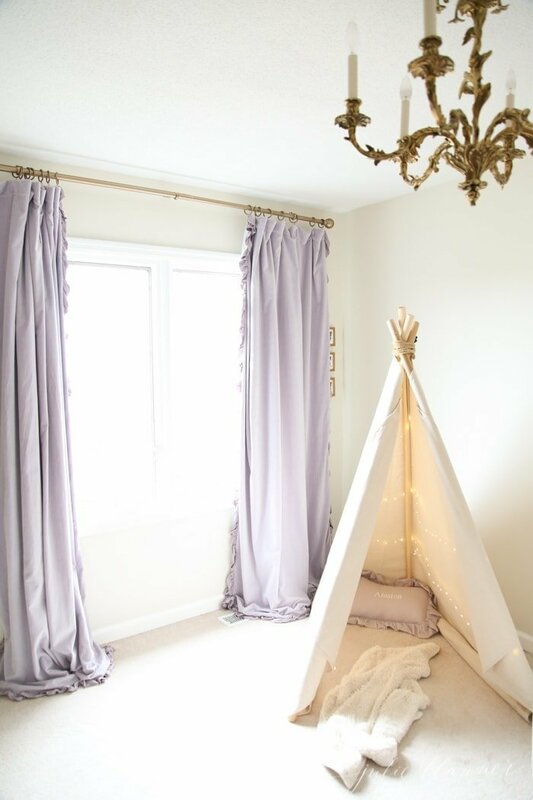 Starry string lights add a little bit of magic to Ani’s teepee. 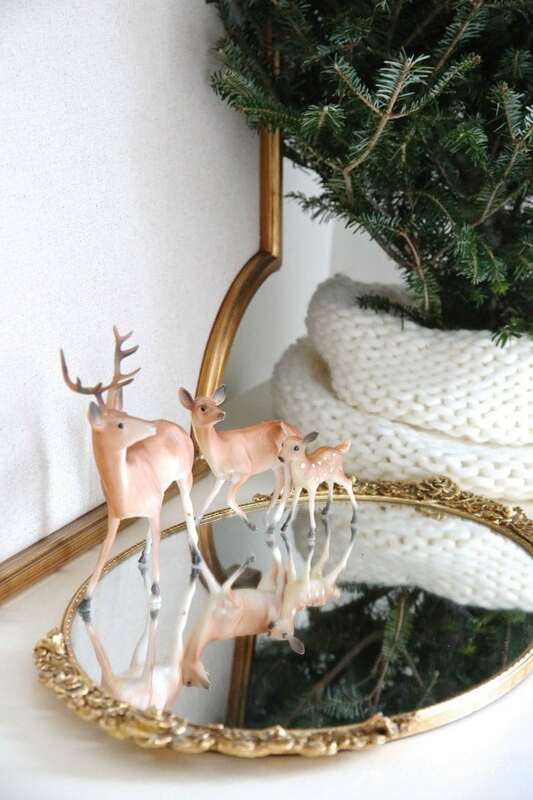 I also adore these vintage deer. And in the guest bedroom I’m anxiously awaiting the new brass headboard and footboard, which will be arriving in a few days. 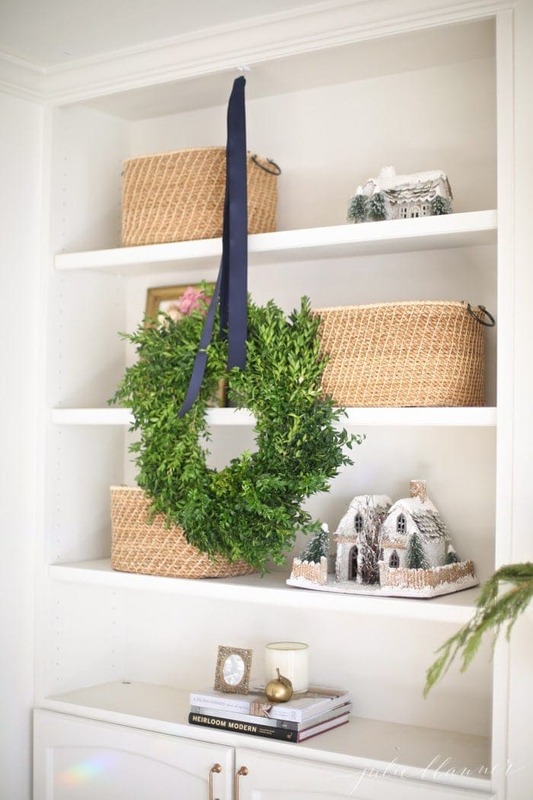 until then a boxwood wreath and soft blue accents are enough for me. 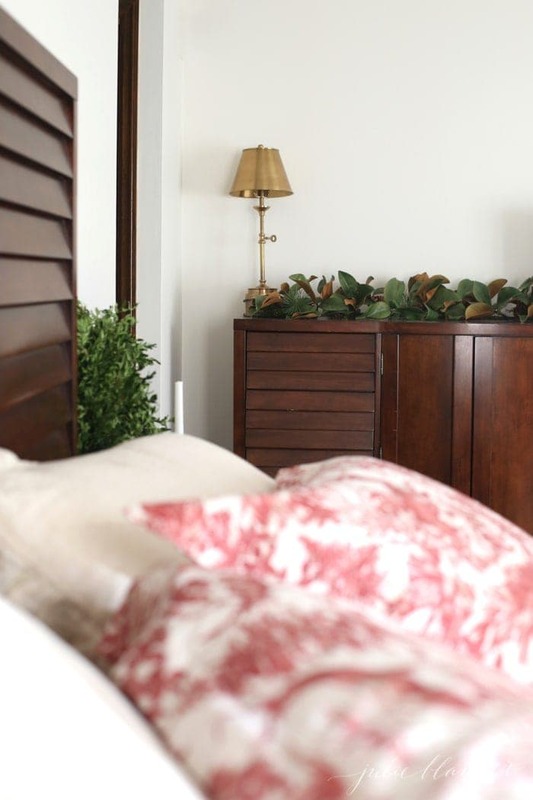 It feels so peaceful, which is exactly how I want my guests to feel. And finally, our bedroom. You can read more about our Christmas bedroom here. I have more to share soon, until then, visit my friend Lucy, the creator of the stunning Craftberry Bush. Stop by and say hello, you’ll be glad you did. I hope to see you again soon. Keep in touch! 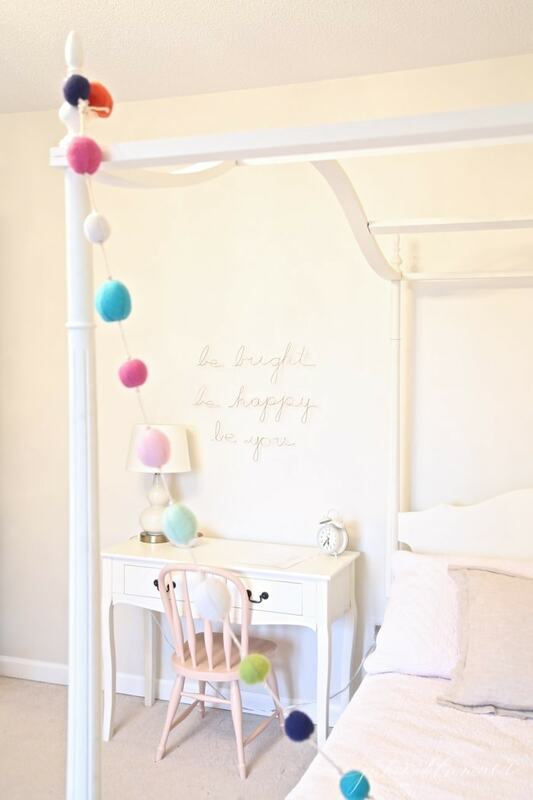 your daughter’s rooms are my favorite- so fun and peaceful and pretty! i love all of your natural touches and your stunning photography. i am ready to move in, ok? Thank you, Cassie! You’re so sweet! 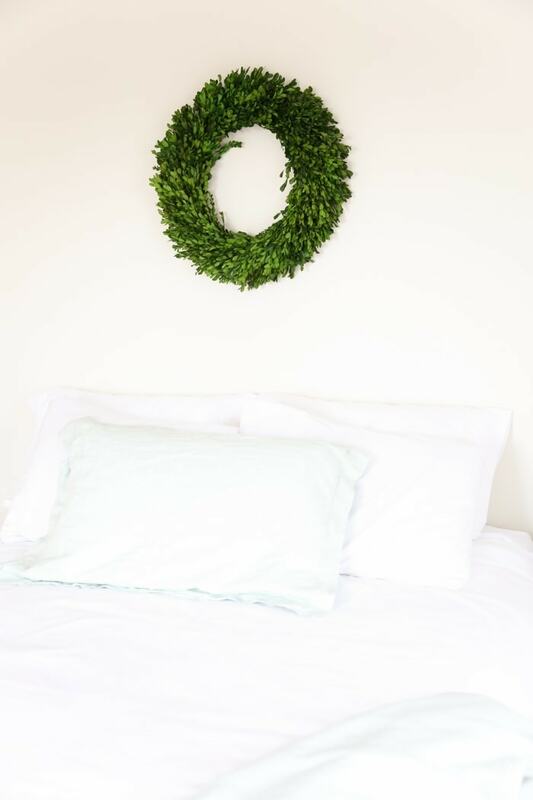 I just love your wreaths! 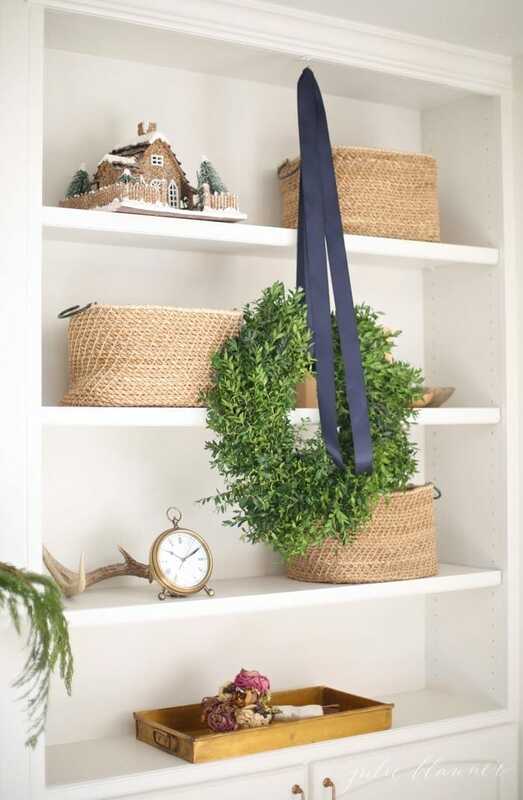 I love your approach of decorating for winter and the use of greenery. Thanks, friend! I really appreciate it. 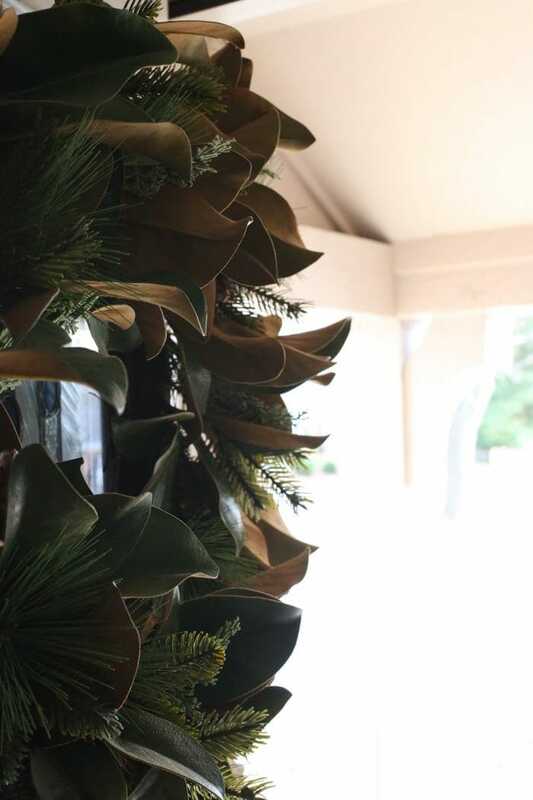 I think your Christmas deco is lovely, so tasteful and not overdone…wonderful! Great inspiration. Thank you, Ingrid! I really appreciate your kindness! Thank you, Lara! 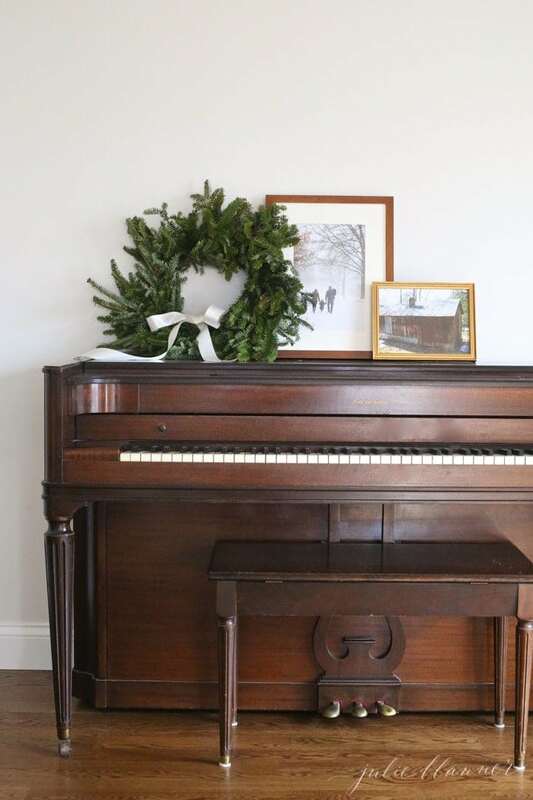 I hope to photograph the living room Friday, along with a little more of our holiday decor. The construction threw me a bit! I LOVE the additional light it adds and think it feels a lot more welcoming. Your home is already lovely and I love your taste and seeing it all dressed for Christmas is magical…love all the pretty views you’ve shared! Thank you, Katrina! I hope you enjoy a beautiful holiday season. Always beautiful! Love all the fresh green and it was fun to see some glimpses of your home I don’t think I’ve seen before. 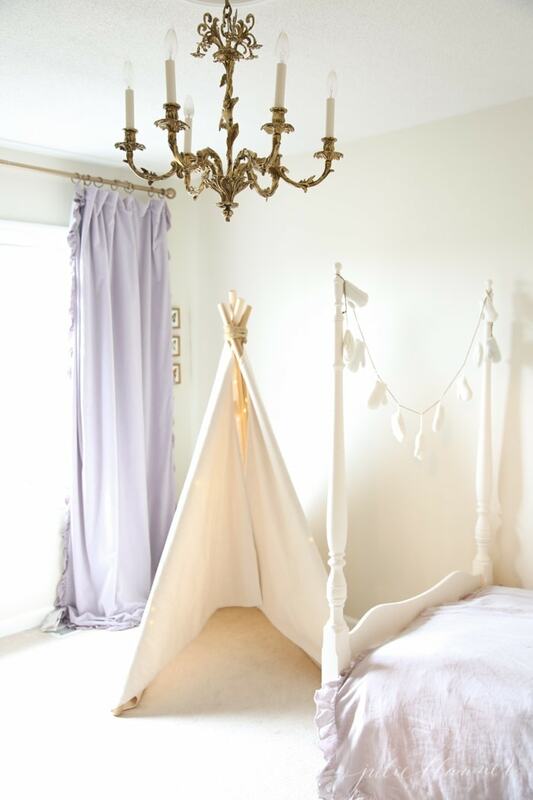 That chandelier in Aniston’s room!!! Thank you, Gwen! I actually have a lot of in progress photos to share, if I could just sit down long enough to write about it. We call Ani’s chandelier a knock out because Chris has literally knocked himself out on it twice. Oops! Looks like I mis-measured a touch. Have a beautiful weekend! Your home is so beautiful Julie. 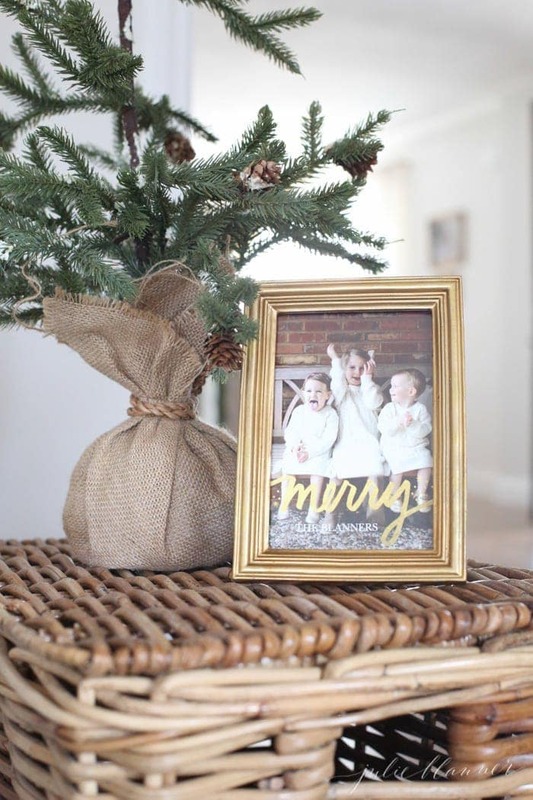 I love that your decor is peaceful and serene yet still feels special for the holidays. The girls rooms are so sweet! Thank you, Jen! I really appreciate it. Have a beautiful Christmas! Julie, I love your pretty and simple tour! I want a staircase to hang garlands on 🙂 Thank you for joining in! Thank you, friend! I really appreciate you having me on the tour. 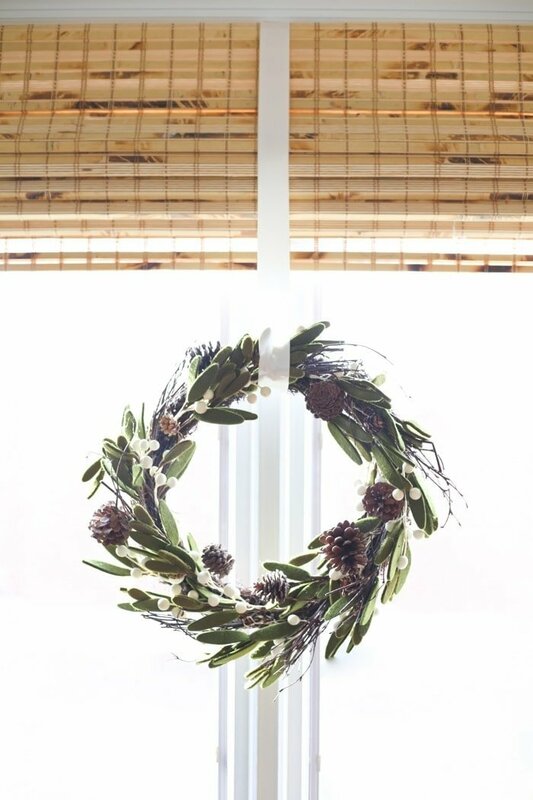 I hope you enjoy a beautiful holiday season! So lovely and peaceful! Thanks for sharing your home. Would love to know about your rug in your living room. I’ve been searching for a natural fiber rug that doesn’t read too orange….yours is a great color. Wonder if you’d share the source and maybe a quick opinion on it? 🙂 Thanks and Merry Christmas! Of course! I love our living room rug. 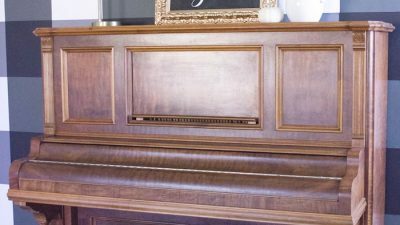 It’s from Overstock and is wool. We’ve had it for almost 5 years and it looks as good as new. Enjoy! Your photos get me overtime. You capture effortless beauty in the best way. 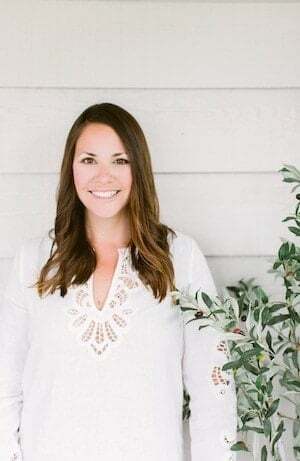 Love your style and home so much and I’m truly so so sorry I’m late to the commenting. Happy Holidays to you and your family. Thank you, friend! Likewise! Happy New Year, Julia! 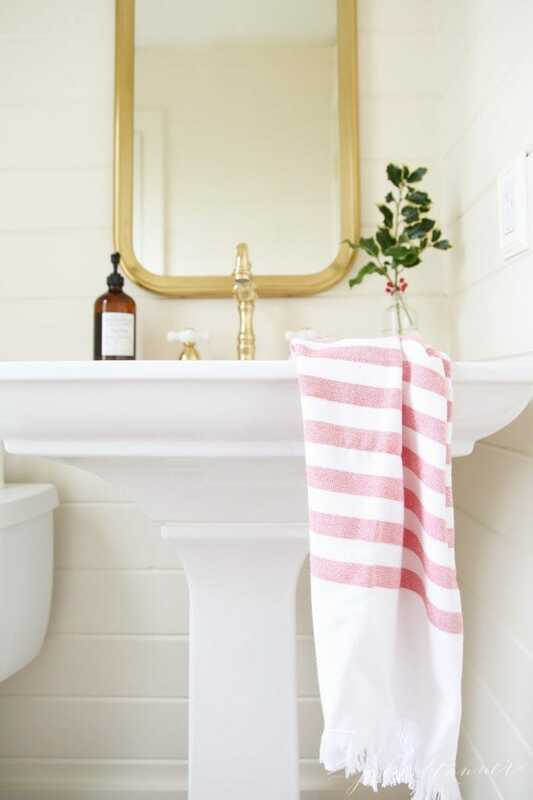 Love the simplicity and touches of beauty in every room!!! Just gorgeous! Thank you, Amber! I hope you had a great weekend! Thank you, Jennifer! I really appreciate it. It means everything coming from you! I always love your style so much! 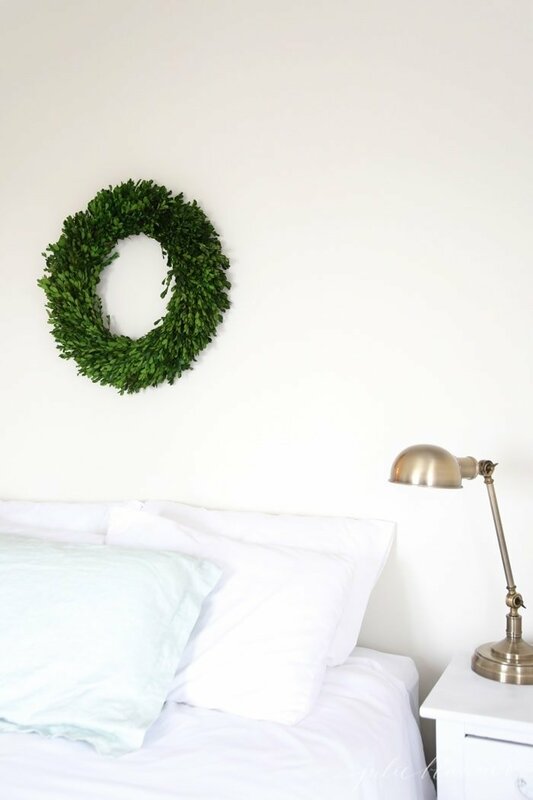 You do minimal but homey and beautiful so well. Loved every inch of your Christmas home! Thank you, Jenn! I hope you have a beautiful week! 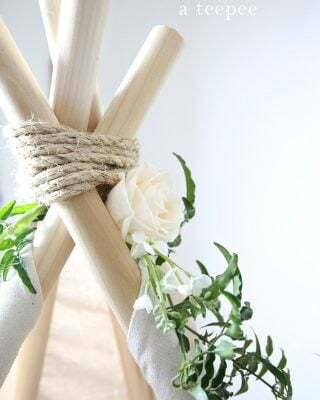 Love your simple, beautiful decor and your home is so lovely! Thank you, Dianne! Happy Holidays! 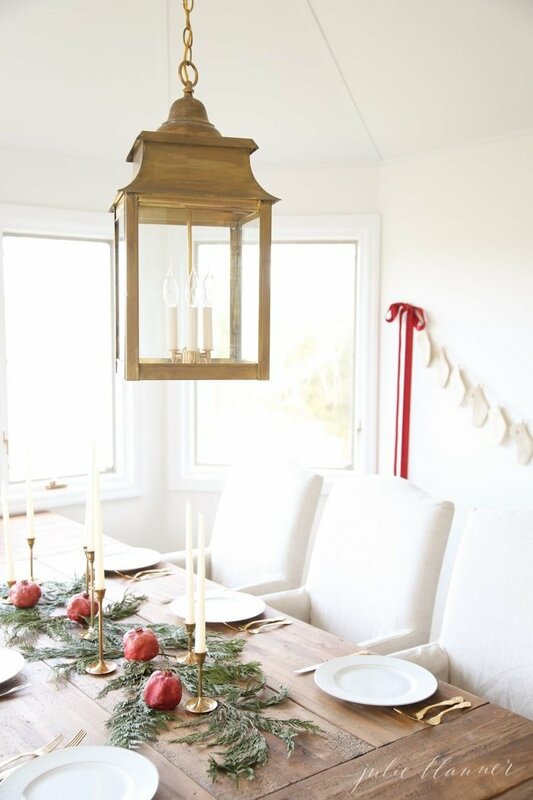 Julie, I love how simply, clean, and minimal all of your decorations are, while still feeling full and cozy at the same time. Beautiful home! 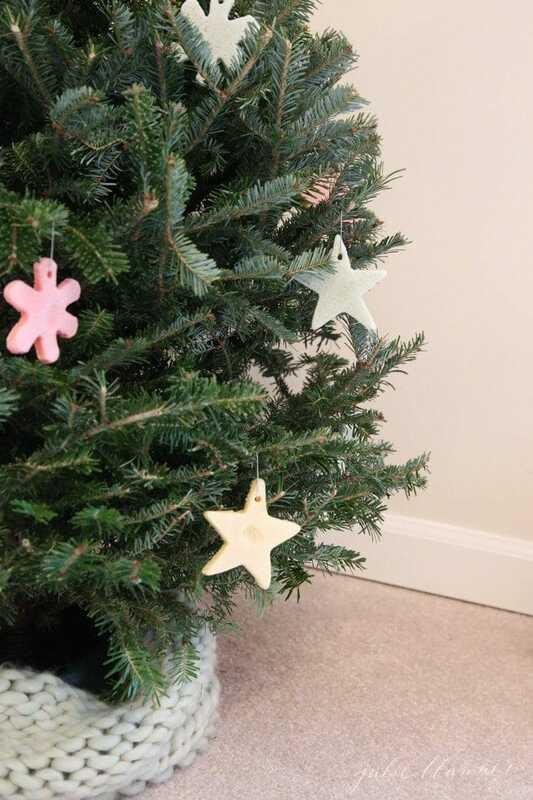 It looks like you and your family really have had a lot of fun decorating so far. Can’t wait to see more! Thank you, Rachel! Happy Holidays! 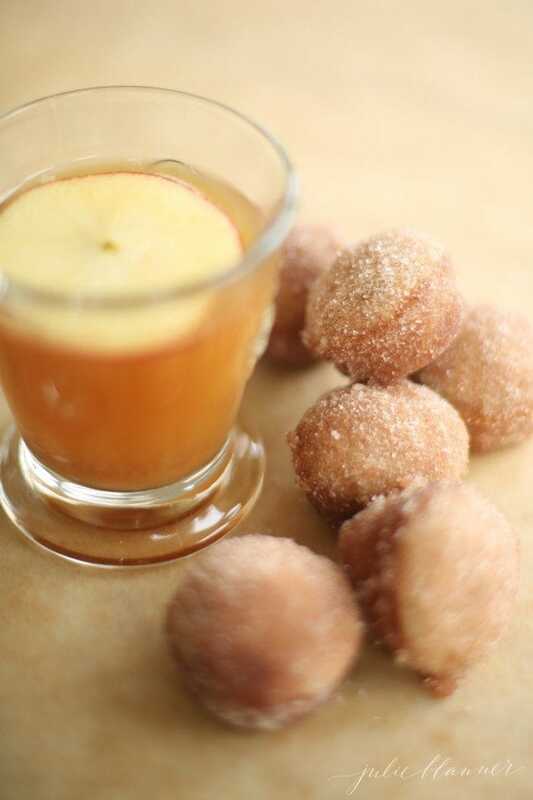 Hi Julie, thanks so much for sharing the lovely photos! Everything looks so pretty. 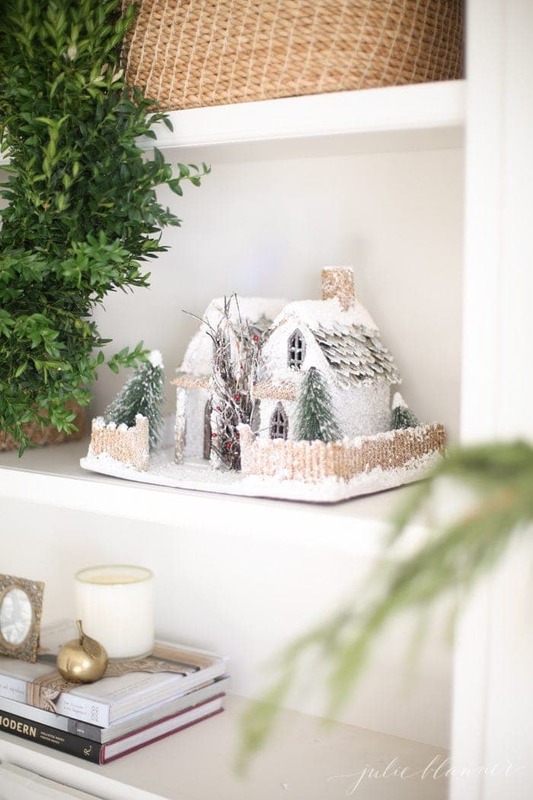 Would love to know where you found the wintery homes used in your bookcases. Thanks and Merry Christmas! Thank you, Katrina! 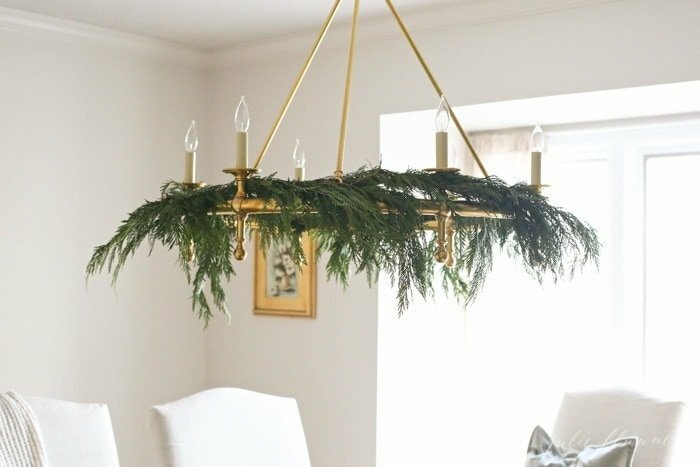 I initially found them at Pottery Barn, but purchased almost identical ones at Michael’s for less than half the cost! 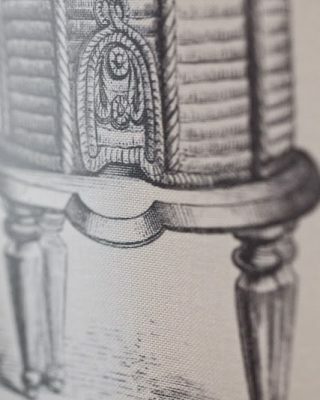 Catching up here, but I love every detail!! It’s all so perfectly simple and balanced…Beautiful! Thanks, friend! I hope you enjoy the holidays in your new home! Absolutely beautiful Julie! 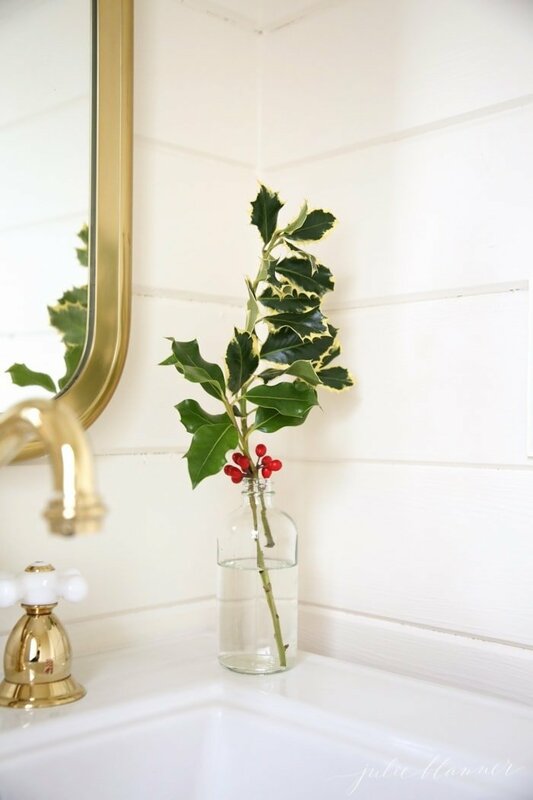 Just the perfect amount of decorating and the perfect decoration for each spot! ???? 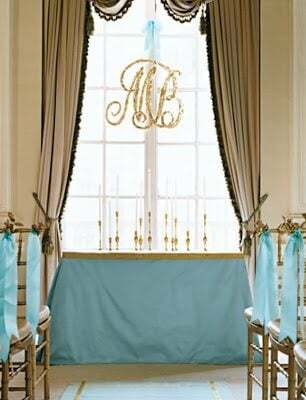 Would you mind sharing your source for the pink/blush curtains? I had my eye on some at West Elm and weekend they disappeared. Thanks and Happy Holidays to you! Thank you! They’re from RH Baby and Child. Hope you have a beautiful weekend!